Before we dig into the image quality portion of this review, let's go over some important qualities of both cameras. Field of view is a measurement of just how much fits into a scene. Holding both the Samsung Galaxy Camera and the Nokia 808 PureView in the hand, it's pretty clear that the Galaxy has the wider lens. Things are far clearer if switch to 16:9 mode as the 808 has a clever sensor that doesn't lose a lot of resolution, but the Camera is still at an advantage. Here's an illustration of the difference in field of view for both cameras. Next up is zoom - both devices have zoom capabilities, but they are quite different. 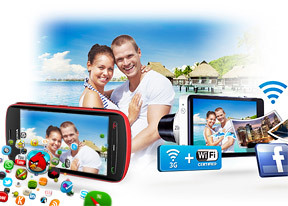 The Samsung Galaxy Camera uses a traditional optical zoom setup like you would find on most point and shoot cameras. It offers 21x zoom (20.9x to be precise) and you can get a close up of distant objects easily. 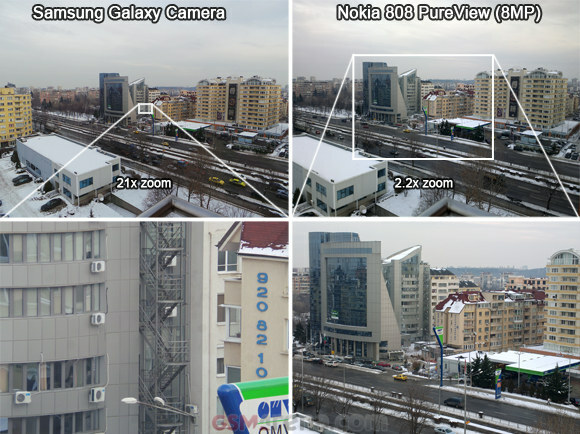 The Nokia 808 PureView relies on its high-resolution sensor instead - in 8MP PureView mode it can zoom up to around 2.3x by gradually reducing the amount of super sampling it does. At maximum zoom, it just gives a 1:1 pixel view. You can zoom more but you have to drop to 5MP or 2MP mode for that. While optical zoom is good because quality doesn't degrade much as you zoom, the sensor of the 808 is very good even at 1:1 view. Still, the difference in maximum zoom is massive as can be seen in the next image. The Samsung Galaxy Camera can only zoom in discrete steps but they are small enough that it doesn't matter. Having a zoom lever is very handy and Samsung will be enabling pinch zooming with an update soon. Nokia's Slide zoom is quite good too - it works with only one finger and is continuous. You can use the volume rocker to zoom as well. Later we'll look at how zooming affects image quality. 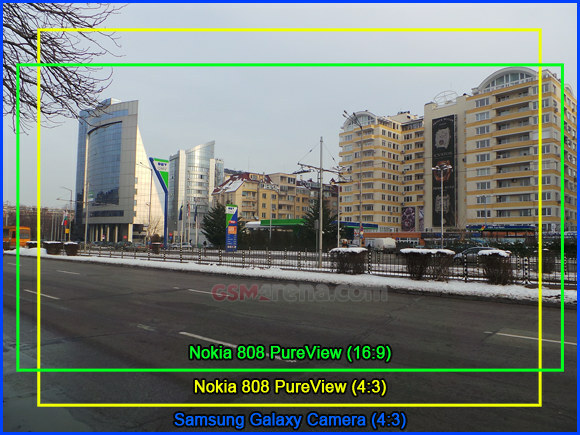 We should note that the Samsung Galaxy Camera and the Nokia 808 in 8MP PureView mode take photos at about the same speed. If you're shooting at full resolution with the 808, however, it takes noticeably longer - a couple of seconds or so. Also, the Galaxy Camera has burst shooting capabilities, which can really help capture just the right moment. Overall, the Samsung Galaxy Camera starts off with an advantage - its lens is wider, it has twice the number of pixels and the zoom capabilities are great. The Nokia 808 PureView isn't out of the running though, its big, high-resolution sensor allowing it to keep the pace.